WIW Spring Formula	Very basic lilac with burgundy outfit. So nice to see you post! You look gorgeous! SO looks mighty fine, too. Best wishes to him. I forgot to add that I wore heels. They have a 2.25 inch heel and I was fine walking 3 long city blocks each way to our parking space. I got these in faux suede over a year ago, they are holding up well and are extremely cheap. I recommend and they fit my wide but small feet. Those are really cute. I can’t believe how cheap how cheap they are. Gorgeous! Completely on the money IMHO for SF. If only I could be so refined. Your sweetie looks dashing. Say I said Hi! :) It’s a shame we were set for different nights. ...and we totally have to debate the score! Lol. You look really lovely. And your SO looks great too. Sounds like a good night. Best wishes to you both. So nice to see you post. You look gorgeous! Your SO looks very handsome. You make a great pair. The ballet sounds very interesting. Denise, it's SOOOO nice to see you! I've thought about you often. You both look wonderful, and I'm sending all the best wishes to you and your SO for continued healing and more peaceful times ahead. Big hugs! Both of these outfits are great, there's something especially elegant about the first one and just the right hard line but pretty in the second. Actually liking SO's outfit especially much too, the striped tie against the dark background and who makes those shoes? Such an attractive couple, best wishes for the future. Great to see you again! You are looking fabulous as I expected. Sending positive reinforcement vibes to you and SO. Your outfits are always inspirational for me. Love the scarf. Wow - both you and SO look fantastic. It is great to see you and your outfit is stunning. Sorry to hear that SO has not been well, I hope he is on the road to recovery. It is great that you have such timeless and yet fashionable style. This is what we all want to achieve - a wardrobe that in 8 years time will look current, stylish and fresh. I do love the pop of colour (and warmth) that your red scarf adds to the ensemble. I love the ballet too and am always amazed at what wonderful athletes dancers are and how they combine that with the ability to tell a story without words. Wow! You both look like rock stars! Great to see you again. You are a handsome couple! YAY, you and SO went to the ballet. That makes my heart happy. Bless you both. Denise, so wonderful to see you post! You look beautiful! Red is fantastic on you. And SO is looking really well for the ordeal he has been under. Whoa, you both look fantastic! It's great to see you again, Denise. You are looking as fabulous as ever. I love your outfit, and how the scarf is wrapped like a cool shrug in the first photo. You both look great! I really like the sheer black blouse. I have similar blouse - long and sheer - but mine is white and it's really difficult to style since everything grins under it. Black sounds much more practical. I like the bright red scarf. I'm sorry to hear your SO has been sick and I hope he's recovering from his ordeal. What a spiffy couple the two of you make! You both look fantastic. Wishing you health and happiness. Fabulous! That red scarf really makes the outfit. I didn't wear scarves until I moved to the Bay Area, but now they are a wardrobe staple. You both look great. Thanks for sharing. You look great! So does your SO. I’d like to go to a non Nutcracker ballet. That’s all they ever have here in the sticks. Best wishes to your SO. You both look wonderful, and it's so nice to see you back on the forum, Coco Lion. Thank you all for the lovely comments. SO is at the infusion center today getting a blood transfusion. The nurses love him because he never complains. I brought him his favorite lunch. He is trying to go without chemo for a month, but he still needs the transfusions every 1-2 weeks. The SO shoes are Timberland, from Nordstrom. This is the second pair I got for him. Totally worth every penny, even when not discounted during NAS. Oh, it is wonderful to "see" you again! Your outfit is gorgeous, and the two of you make a beautiful couple. I am sorry your SO is dealing with such tough health issues; he will be in my thoughts. Please don't be a stranger! You two look fabbly chic. Every time I see mules/slides I think of you. I hope to “see” you around more. You both look fabulous! I miss your posts! I think of you in your softer colors and then I am amazed at how fantastic you look in black and red! You look fab. Beautiful red accessories. Lovely to see you, both looking very smart/handsome/fashionable after a tough time. This is a very cute, chic outfit! 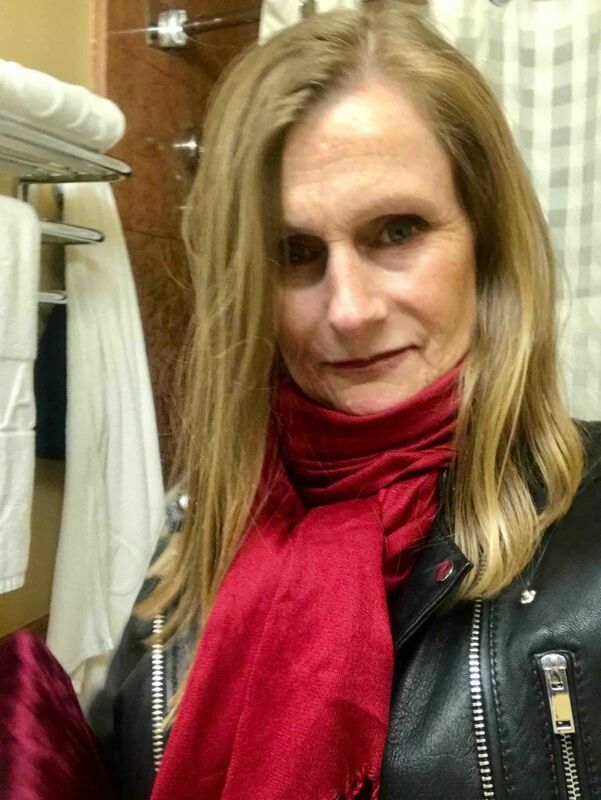 The play in textures and with textures' reflection of light is fun too: leather + silk + mat red scarf. You look smashing! 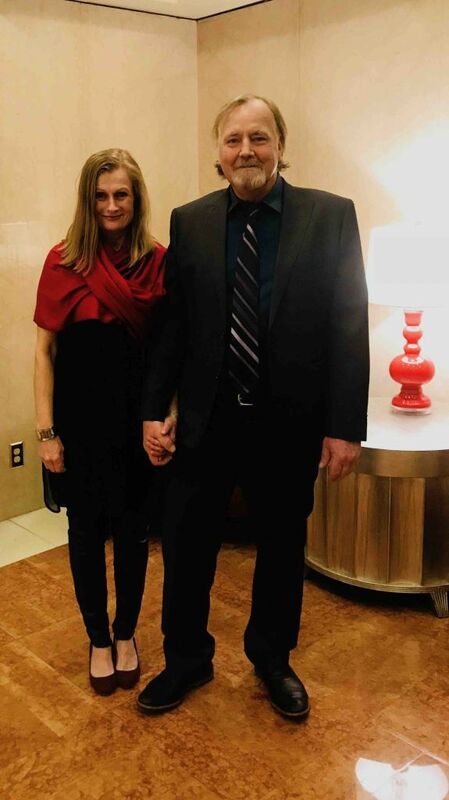 You both look fantastic - glad SO's through with the round of chemo. Love the leather with the sheer - even blurry you look fab! O-o-h! I just looked at scarves on Amazon. So many choices in plain silk scarves that I haven't been able to find in stores. Ms Maven, here is scarf from Amazon. The scarf is cashmere. It's nice but not a tight weave, I don't know how to explain it other than to say it can snag. But I'm happy with the item and it's a great price. Both of you look fab. Wishing your SO and you all the best. He will continue feeling stronger every day. Wow, such a treat to see you&SO Denise! You both look smashing! Loved your outfit, the sheerness of the long shirt(dress) and the drape of the cashmere shawl are so arty, perfect for a ballet show! !